Holiday Hootenanny Silent Auction for Atlanta Habitat! We’ve got a GREAT silent auction coming your way at the 5th Annual Holiday Hootenanny! A HUGE thanks goes out to all who have donated items for this year’s edition. A Warren Haynes autographed Takamine acoustic guitar, courtesy of the Big House Museum and Executive Director Rob Schneck. Warren was thrilled to sign this guitar and added the peace sign. I can only imagine that the lucky soul who takes this guitar home will be feeling the mojo! 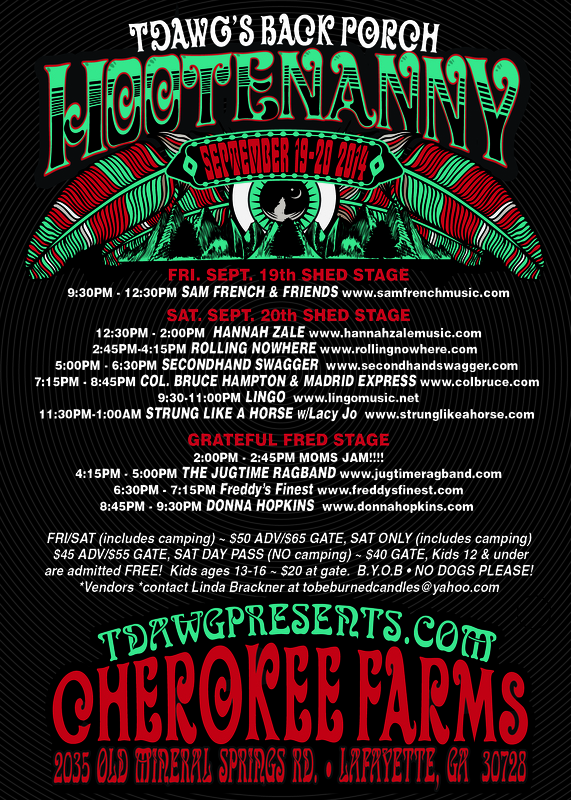 Both FloydFest 16 (July 27-31, 2016 Floyd, VA) & 20th Annual Suwannee SpringFest (March 17-20,2016 Live Oak, FL) have donated a pair of their VIP passes for this year’s Holiday Hoot! I have attended both many times – as both a promoter and a patron – and folks, you can’t go wrong! Such beauty lies in both locales, smothered in the Spanish moss off the Suwannee River in FL or glowing as a huge spark in the midst of the magnificent Blue Ridge Mountains in VA. I cannot distinguish between the two but to tell you that each one is so incredible you never believe it can be topped. Both festivals are so majestic and powerful – the music never stops! That is, until the festival ends 😉 Like my Back Porch Hootenannies and HarvestFests, you take that energy with you beyond. The FloydFest lineup features – among many others – Greg Allman, Bruce Hornsby & the Noisemakers, Railroad Earth, Leftover Salmon, The Wood Brothers, Nahko & Medicine for the People, Keller Williams w/ More Than a Little, Larry Keel Experience, and more! You can visit the website for complete info. Suwannee SpringFest brings you an equally amazing lineup, featuring John Prine, The Del McCoury Band, Donna the Buffalo, Keller Williams Grateful Grass, Jim Lauderdale, Larry Keel Experience, the Virginia Daredevils, and the list goes on! Check out their website for complete information! From photographer Ian Rawn, a close up of Mick Jagger from the Rolling Stones appearance at Grant Field on the GT campus last summer! Y’all we’re going to have some great items from restaurants and resorts, local artwork and jewelry, and even something hand-picked from Jim Lauderdale! Click Here for the schedule and a link to purchase Advance Tickets – remember you get a DVD of the incredible Blueground Undergrass reunion performance from the 2014 edition of the Holiday Hootenanny! You will receive your DVD when entering Terminal West. Please share with your friends, co-workers, and others who need to be there! Speaking of soul, check out this southern soulful groove laid down by Secondhand Swagger! These folks will be rockin’ the infamous “Happy Hour Set” from 5-6:30PM on SAT Sept 20! And folks, the musical mojo will kickin’ hard that day! For those of you who are not familiar with Sam French, well that’s a great reason to show up on Friday night, September 19, at the Hootenanny! This man is drenched in southern, his style genuine, and his product real. Ted Norton, guitarist for The Grapes, will be joining Sam’s band that night and also be around all weekend long sitting in as an artist-at-large. Below is some fine video of Sam and his band performing an original, “Few Regrets”. Enjoy! Spread the good word to your friends and family, y’all, as HOOT #17 promises to be as good as advertised! HOOOOOOOOOOOOOOTENANNY!!! 7th Annual Jerry Day ATL on SUN JULY 27! 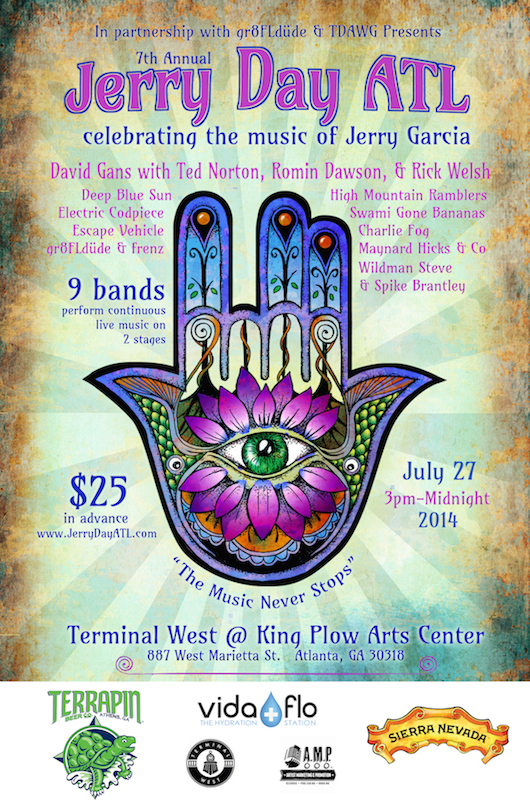 The summer keeps on truckin’ along, which means it’s time for the 7th Annual Jerry Day ATL at Terminal West this Sunday, July 27! We are extremely excited to bring to you a wonderful showcase of the music that was/is The Grateful Dead and the spirit that envelops music fans of all ages. Out of this spirit arises interest in the world of roots music – bluegrass, blues, jazz, classic/outlaw country to name a few genres under the umbrella – which is what has been at the epicenter of the Dead’s sound and style. You can purchase your advance tickets online at the Terminal West website or at the box office TUE-FRI 11AM-5PM and on show nights. Advance tickets are also available at Maple Street Guitars and The Chamblee Bistro. Also sending out a big THANK YOU to all the folks at Terminal West for their generosity and willingness to work with us on this project as well as our crew of volunteers! This is a great venue, and I can’t WAIT for 4th Annual Atlanta’s Holiday Hootenanny in December! Below is a complete schedule of Sunday’s festivities, beginning at 3pm on the Main Stage. 4:00 PM Maynard Hicks & Co.
11:00 PM David Gans & some Grapes! Y’all we’re going to have ourselves one helluva time on Sunday – I hope can make it! Please spread the good word to your friends about this one even if you are unable to attend! 7th Annual Jerry Day ATL 3 weeks out! That’s right y’all! We’re only three weeks out from one helluva celebration of music, fun & friends for this steady stream of Grateful Dead from 3pm – midnight, and no song is repeated! I spoke with guitarist Ted Norton, who will be performing with songwriter/author/Grateful Dead Hour host/music historian David Gans, and he emphasized how freakin’ pumped everyone is to be part of this jam, so round up your posse and make plans to come where the music never stops…at least from 3-midnight! Get your Advance Tickets by Clicking Here! Terminal West is the perfect venue for this event – they have the Stationside Restaurant directly connected so you will never go hungry. The second stage will be located inside the restaurant.